Outlook is improving day by day and providing lots of new and exciting features. Many outlook features are in the section which you can say “I am in love with it”. Outlook can also create lots of problems. A very rare and most annoying problem ” we didn’t find anything to show here” can also occur. This problem can waste few very precious hours. Click on the specific folder where you receive error: we didn’t find anything to show here. At the top bar in outlook, click on view TAB. Click on Change View and you will find options in drop down menu. There you will find that folder has been set to Hidden state. 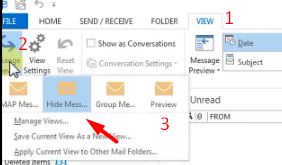 Change it to the preview and all emails will be displayed in the folder. This can happen more than one folders of Outlook. You just need to apply the same method on all folders in which you face this error.